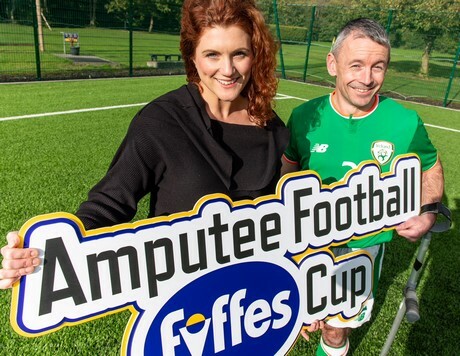 Irish banana importer Fyffes has signed-up to support the Irish Amputee Football Association as it prepares to select a team that will represent Ireland in the forthcoming Amputee World Cup being held in Guadalajara, Mexico at end-October / early-November next. Under the arrangement, the company – already closely linked to football through its sponsorship of Dundalk FC – will sponsor ‘The Fyffes Cup’, a three-way cup competition which will be played at Oriel Park, Dundalk on Saturday, 22nd September next. Billed as the last major stage in Ireland’s World Cup preparation, it is also seen as the final opportunity for players to impress selectors who will choose the seven-man starting team from a squad of 13 to represent Ireland in what will be their second Amputee World Cup. The one-day Fyffes Cup competition will be played in a round-robin format with teams representing Bohemians, Cork City and Shamrock Rovers competing to decide the winner. Each team will comprise five players, with substitutes allowed. Games are 15 minutes long with no half time and all teams are permitted a one-minute time-out per match. When all three clubs have played each other twice, the top two will progress to the final to decide who lifts the cup. Inspired by the recent success of the Irish ladies’ hockey team, the Irish Amputee team is approaching its World Cup campaign with confidence. Their qualification for the World Cup – in which they have been drawn in Group A alongside hosts Mexico, England and Uruguay – follows from their winning 6th place in the 2017 European Championships. Overseeing the contribution that Fyffes will make is the company’s managing director, Gerry Cunningham, himself a keen Dundalk FC supporter. “We applaud amputee footballers and wish them well in their efforts to bring success to Ireland, recognising the extent to which each has had to combat adversity in order to achieve their goals,” Mr. Cunningham said.